The Dream Buffet is Served! but you want a constant source of answers to your travel writing questions, whether an in-depth lesson from our webinars, an instant script or tactic for dealing with a tricky editor or client situation, or a quick answer to the perennial question “where should a pitch this story?”, we bring you the Dream Buffet. This means that you can not only get instant answers to your questions, but you can also get information however works best for you, with the ability to access our webinars on or offline, as audio files when you’re in the car or at the gym, or in print form if video is really not your jam. Mastering AP Style: The Grammar Style of Choice for Publications: Putting in the time to learn this journalism fundamental will set your pitches apart. The Art of the Essay and How to Find Them Everywhere: Whether you’ve been writing on a personal blog for years or just emails home from trips, you’re on your way to publishing essays. Taking Control of Your Freelance Travel Writing Finances: When your travel and meals aren’t free, they should be written off on your taxes. Along with magazines, books, conferences, and more. Taking Control of Your Freelance Travel Writing Time: If you want to earn well as a freelance travel writer, managing your time professionally is the very first place to start. Taking Control of How You Track and Reach Your Freelance Travel Writing Goals: Without a plan for your business, you’re not likely to enjoy where it ends up as much as you could with these steps. Taking Control of Your Ideas, Pitches and Follow-ups: Even if you’re a pitch wizz and an idea magnet, you’ll struggle to get pitches out if you’re missing this. How To Earn Big With Travel Content Marketing: We talk about the different opportunities for travel content marketing writing, what kind of pay you can expect, and where to start looking for these opportunities. How To Locate The People Who Need Your Travel Content Marketing: We continue looking at where the big money in travel writing is hiding and discuss how to identify the people you can approach for this type of work, whether companies or tourism boards. How To Craft A Travel Content Marketing Pitch That Gets Attention: I break down the steps of putting together your own pitch to send cold to companies and tourism boards you think would benefit from your services. How To Close The Deal: Proposals And Phone Calls That Get Results: In this webinar, we’ll cover, in detail: the exact questions to ask and path to follow in your call to ensure the best results for you and your prospect. Pricing, Negotiating, And Contracts (For Travel Content Marketing): Here you can find out what you “should” be charging in different situations…along with what you could be asking for when an editor names a price to you. How to Sell Blogging to Travel Companies and Tourism Boards: In this webinar, we discuss exactly what statistics, industry terms, and buttons to push you need to know to get yourself in the door with, fielding assignments from, and signing recurring contracts with tourism boards and travel companies. Best Practices When Writing on the Web for Travel Companies: Even if you’re had your own blog for years, tune in to learn the best practices in blogging technique and style when writing for companies and tourism boards. Ghost(writ)ing on the Web as a Travel Writer: We unpack the process of creating ghostwritten content for your travel blogging clients. The Difference Between the Photos You’re Shooting Now and What Magazines are Publishing: The photos you’re shooting for Instagram, Facebook, Twitter, and your blog won’t cut it for magazines. Creating a Shot List to Organize Your Trips Around Saleable Photography: This one technique will keep you from coming home without the photos you need to land photo contracts with your pieces. Plating, Staging, and Food Photography: Bringing Still Lifes to Life: You could pay $1,200 for a weekend food photography workshop, but here’s what you need to know to get started. The Art of the Follow Up — The Simple Key to Dramatically More Assignments: Your guide to what might be the most valuable hour of your entire week. What Types of Articles Should You Be Writing? 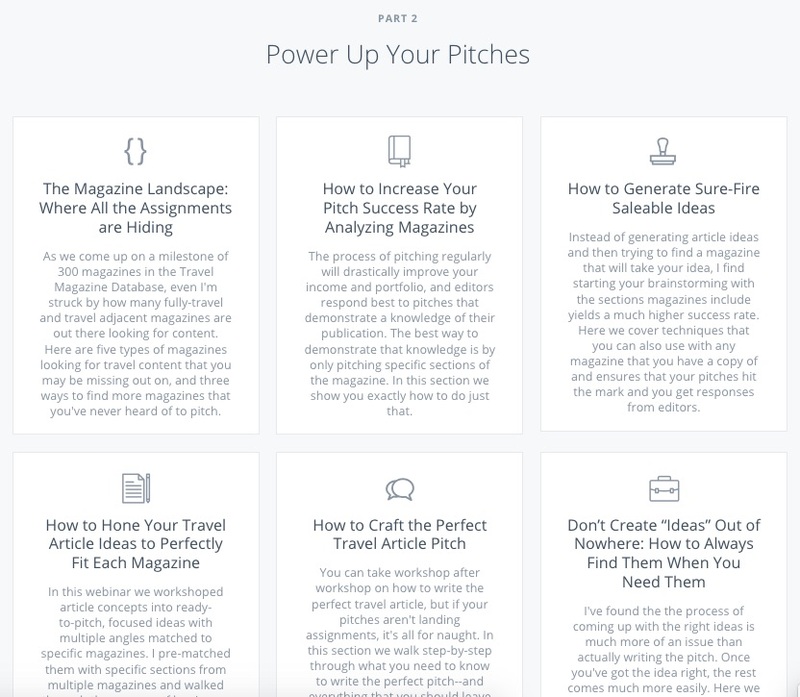 : Once you see each article idea in 10 different formats, you’ll never hurt for pitch ideas. Mastering Style at a Sentence by Sentence Level: Your pitches will be the only clip you need when the quality of your writing shines through. Story Structure to Take Your Feature Travel Articles to the Next Level: Narrative writing can be terrifying. Once you learn the underlying structure though, it’s smooth-sailing. What is Standing Between You and Your Travel Writing Goals: The most likely roadblocks between you and your travel writing goals–and how to tackle them. How to Clearly Catalog the Work and Opportunities You Have Now: To know where your travel writing business needs to go, you need to be honest about where it is now…in numbers. Taking Stock of the Past Year to SWOT Yourself Into Shape: Align your freelance business with the marketplace and the best place in it for you. Getting Crystal Clear on What You’ll Accomplish in the Next Year: Rather than goals–an all-or-nothing approach to what you’ll do next year–focus your year with this method. Mapping Out Your Step-by-Step Plan for 2018 Success: Follow along with your year-long work plan as we workshop three attendees’ live. Article Nuts and Bolts: Putting Together a News Brief: Learn the core of how all front-of-book magazine pieces are constructed. Article Nuts and Bolts: Putting Together a Front-of-Book Round-Up: Hone in on the easy-to-write (and pitch!) staple: the front-of-book round-up. Article Nuts and Bolts: Putting Together a Trend Piece: An in-depth look at the staple of magazines front-of-book and feature sections everywhere: the trend piece. Article Nuts and Bolts: Putting Together a Business Profile: An in-depth look the type of article that should be the bread and butter of your freelance travel writing toolkit. What exactly will you get in the Dream Buffet? Our webinar libraries already include more than 50 one-hour webinars–everything in our library. The paid library is the only other way to get your hands on the videos and transcripts of our webinars after they air. There, however, each webinar package costs $19, so our full libraries offer more than $1,000 of value right now. And we add four to five more webinars each month! In our Travel Magazine Database, we include analyses of more than 600 magazine. But these are largely not magazines you could walk down to Barnes & Noble and buy. Many are only available through the magazine publisher, while others we’ve specifically picked up in person in other countries so you can have access to them. If you were to go out and buy those magazines, you wouldn’t be looking at normal newsstand prices like $4.99, but sometimes as much as $25 an issue, so you’re looking at more than $5,000 of value just from the magazines in the database alone. That’s before you factor in all the hours our writers save you by analyzing the magazines! They typically take our writers up to two or three hours to analyze…and they’re used to looking at magazines like this. When you first start analyzing magazines, it can take you four to six hours–time that you don’t have to spare when you’re trying to bring your travel writing career to new heights. Then, there’s simply nothing else out there like our Q&A library, so we can’t even put a dollar value on that for you except to say that it’s a level of answers to questions that are typically only available for our full coaching program members, who pay $500 a month. Once you confirm your Dream Buffet spot through the payment link, we’ll get cracking on setting up access to your three different resources: your private webinar library, the On-Demand Coaching Concierge, and the Travel Magazine Database. Depending on what day of the week and time of day you register, this may take up to 48 hours to complete. As soon as you register, you’ll receive an email with a questionnaire to help us tailor what we add to the library around your needs. Have more questions? Let us know at questions@dreamoftravelwriting.com. Grab your seat at the Dream Buffet here. Did We Become a Travel Blog? What is All of This About Points and Miles? How Confident Do You Feel Writing Short?